There’s no more important role in the NHL today than that of a proven first line center. Teams have won without Vezina-caliber goaltending; see the 2010 Chicago Blackhawks. Similarly, teams with questionable defenses have succeeded; here’s looking at you, 2017 Pittsburgh Penguins. Yet, teams without a true top center generally don’t win. That’s because a number one center is asked to bring elite production, succeed in the faceoff circle, not be a liability in his own zone, and improve his linemates. A look at recent Stanley Cup winners conveys this. The Washington Capitals had Evgeny Kuznetsov, the Penguins had Sidney Crosby, the Blackhawks had Jonathan Toews, and the Los Angeles Kings had Anze Kopitar. Every one of those players is among the league’s best centers and was key to helping his team capture Cups. Meanwhile, the Buffalo Sabres, New Jersey Devils, Toronto Maple Leafs, and Edmonton Oilers, teams who have drafted first overall in the past few years, have recently lacked a franchise center and drafted one. This article looks at, analyzes, and attempts to rank the best first line centers in the league today. I took into account a player’s offensive output, his defensive abilities, how successful he is at taking faceoffs, and how much he improves his linemates. Let me know in the comments below which ranks you agree and disagree with. 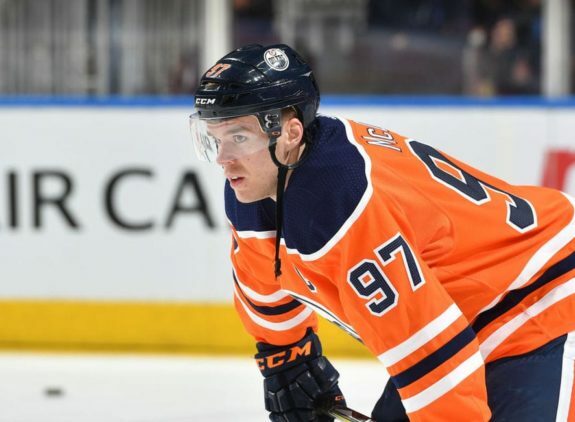 Connor McDavid broke into the league in 2015 with sky-high expectations as the first generational talent since Sidney Crosby a decade earlier. McDavid has exceeded all expectations, staked a claim as the league’s best player in 2016-17, his sophomore season, and solely took over the top spot last season. Over the past two seasons, he has 23 more points than any other player and 30 more than the next center, Crosby. Since debuting, his 256 points are third-most in the league behind Patrick Kane and Crosby despite missing 37 games his rookie season. McDavid has two Ted Lindsay Awards, two Art Ross Trophies, one Hart Trophy, and is a two-time All-Star. In 2016-17, when he won his first Art Ross Trophy, he led the league by 11 points and had 23 more than any other Oiler. His 31.7 point shares in his first three seasons are third-most all-time among centers behind Wayne Gretzky and Crosby. He has improved in nearly every aspect, including goals, points, and five-on-five scoring and regularly improves his linemates’ metrics. If there’s one area he needs to improve in, it’s in the faceoff circle, where he’s a career 42 percent. Crosby was the league’s best player for a decade, from 2006-07, his sophomore season, through 2016-17 before turning the reins over to McDavid. What Crosby has done in his career is incredible, especially considering injuries have cost him over two seasons worth of games. He has three Ted Lindsay Awards, two Hart Trophies, two Rocket Richard Trophies, two Art Ross Trophies, and is a seven-time All-Star. Oh, and he has three Stanley Cups and two Conn Smythe Trophies. Additionally, he has five more top-five finishes in Hart Trophy voting. Since debuting in 2005, only Alex Ovechkin’s 1,122 points are more than Crosby’s 1,116, although Crosby has played in over 100 fewer games. His 1.29 points-per-game (P/G) mark is the highest by .10 in that span and sixth-highest all-time. It took him 757 games to reach 1,000 points, 12th-fewest in history, but none of the players who reached that mark quicker did so after the 2004-05 lockout. He continues to excel as he ages, with at least a point-per-game average in all 13 seasons, already tied for the 10th-most such seasons. He has done all that while playing with less than stellar linemates, often centering a line of unknown, speedy wingers while Evgeni Malkin plays with more proven scorers. 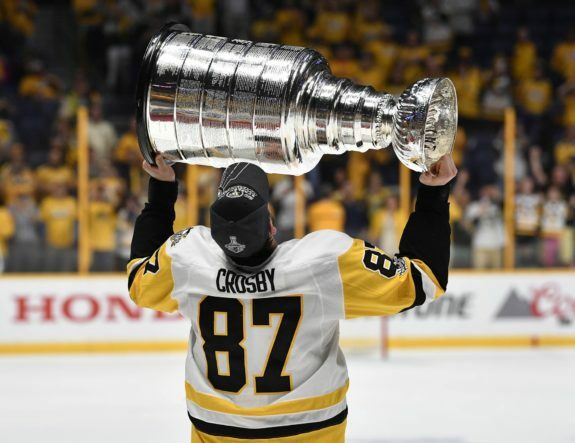 Crosby has a history of turning those lesser known wingers into household names – Chris Kunitz, Conor Sheary, and Jake Guentzel to name a few. Slovenian Anze Kopitar is a different type of player than McDavid and Crosby. He hasn’t and likely won’t put up the lofty offensive totals on a consistent basis that the others do. He also plays on the penalty kill more than other top centers, with an average of 2:04 of shorthanded time per-game the past three seasons, the highest of any center on this list. 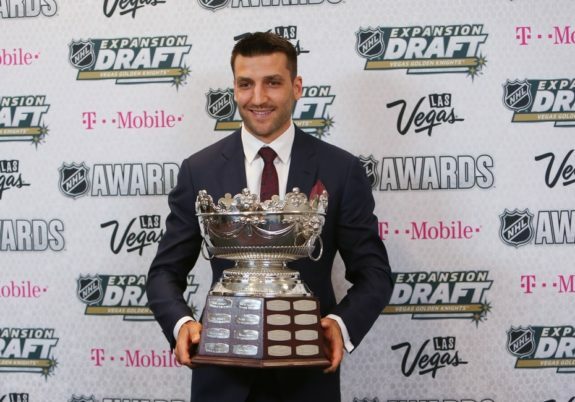 The Kings drafted him 10 picks after Crosby in 2005 and he has emerged as the league’s best two-way center as evident by his two Selke Trophies and four other top-five finishes, inheriting the accolade from Patrice Bergeron in recent seasons. Kopitar also has two Stanley Cups and a Lady Byng Trophy to his name. He set career highs offensively in 2017-18 with 35 goals and 92 points. It was his first season as a point-per-game player and has had five others with at least a .90 P/G average. He’s also known for his work in the defensive zone and started in the offensive zone just 33.9 percent at five-on-five last season, lower than McDavid and Crosby. 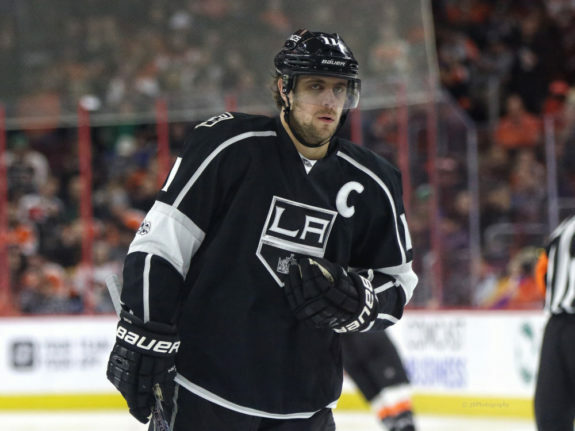 Kopitar thrives at the faceoff dot, at 54.1 percent last season, including 55.1 percent on the penalty kill. There isn’t a better all-around center in the game today than Kopitar, who can perform offensively at an elite level while thriving in the defensive zone. Former number one overall pick Nathan MacKinnon took longer than fellow top picks McDavid and Crosby to produce at an elite level. It took him five seasons to be exact as his 2017-18 season is his only elite season so far, but what a year it was. His 39 goals and 97 points nearly doubled previous career highs. He was top-10 in the league in both categories and his 39 goals were the most by a Colorado Avalanche player since the 2004-05 lockout while his 97 points were second-most. He was a Hart Trophy finalist for the first time and finished second to Taylor Hall by 70 votes, the smallest margin since 2013. He was also named an All-Star for the first time. Prior to last season, MacKinnon’s career highs were 24 goals and 63 points, both set during his 2013-14 rookie season. He has, however, had his point production increase each of the past three seasons and was on another level last season. 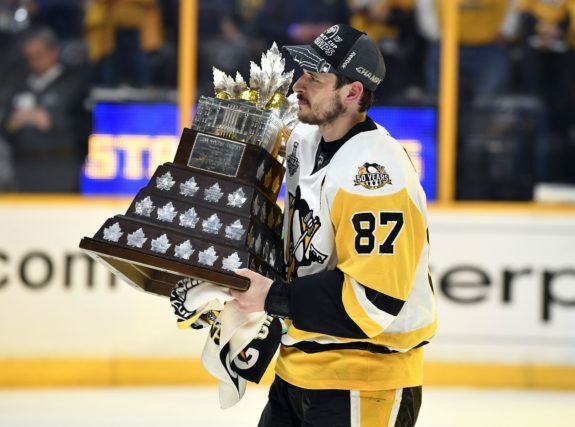 He was on the ice for 40 percent of Colorado’s five-on-five goals last season and was dominant in the postseason with three goals and six points in six games against the Nashville Predators. If there’s a knock to his game, it’s that he struggled at taking faceoffs at just 41.9 percent in the regular season and 37.6 percent in the playoffs. He also has a history of injuries with 36 missed games in his career, including eight last season. The best two-way center in recent memory, Bergeron has been a Selke Trophy finalist each of the past seven seasons and has finished top-five in voting nine straight seasons. In total, he has four Selke Trophies and one Stanley Cup and his .98 P/G average in 2017-18 was the highest of his career after scoring 63 points in 64 games. Always with strong possession metrics, the Bruins have controlled over 50 percent of five-on-five shots with Bergeron on the ice in all but one season since 2007-08. He is incredible in the faceoff circle at over 55 percent in each season since 2009-10, including 58.3 percent on the penalty kill last season while averaging 1:49 of shorthanded ice time per game. He has also had a positive turnover ratio in 10 of 11 seasons since 2007-08. By comparison, Crosby has never had a positive turnover margin while Kopitar and MacKinnon each have three. Auston Matthews, the 2016 first overall pick, is already one of the game’s best players after two seasons. He took home the 2017 Calder Trophy after a 40-goal, 69-point campaign. Since debuting in 2016, he has nine more goals and two more points than any other Maple Leaf. In fact, his 74 goals the past two seasons are tied for fifth-most in the league and his .51 goals-per-game (G/G) rate is tied for third-highest among players with at least 100 games since his debut. Plus, he hasn’t relied on power play scoring to find success with just 13 goals on the man advantage. In terms of playing a two-way game at an elite level, Matthews is well ahead of where others on this list were at this point in their careers and even ahead of where some are now. He improved in the faceoff dot from 46.9 percent in his rookie year to 54.5 percent last season, only started in the offensive zone 32 percent at five-on-five, and controlled 67 percent of five-on-five goals last season. He is also safe with the puck with a plus-33 turnover margin for his career. 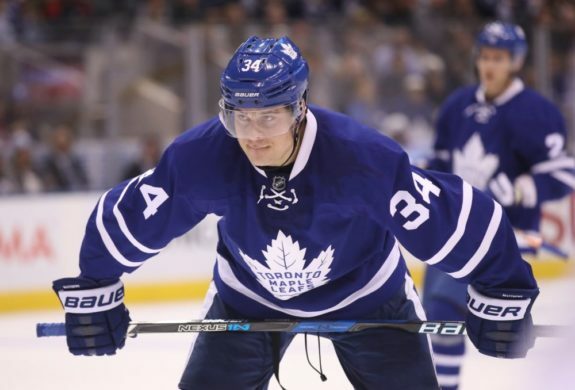 He propped up the majority of teammates he played with, including Zach Hyman and William Nylander. Like others on this list, if there’s a knock to Matthews’ game, it’s that he struggled to stay healthy last season with 20 games missed to a concussion and shoulder injury. But, when he returned on March 22 from his shoulder ailment, he didn’t show signs of rust with 13 points in nine games, including a five-game point streak to end the season. He should only continue to improve in 2018-19 after he developed from his rookie year into last season. He was a point-per-game player last season for the first time and showed that he can be a strong two-way center. Additionally, his production could skyrocket this season with the addition of John Tavares to the team. Tavares’ presence means that on some nights Matthews will see the tougher matchups of the two, but on others he will receive the easier matchups. Finnish-born Aleksander Barkov is the heir apparent to Kopitar and Bergeron as the game’s next elite two-way center. He was a top-five finisher in Selke Trophy voting for the first time in 2017-18 and has two top-five Lady Byng Trophy finishes as well. The Florida Panthers drafted him second overall behind MacKinnon in 2013 and has been the Panthers’ best center since his rookie season in 2013-14. In 2017-18, he netted 27 goals, had 78 points in 79 games, and won 53.5 percent of faceoffs. Last season, he set career highs in games played, goals, points, faceoff percentage, and time on ice with 22:04 per game, second-highest in the league among forwards behind Kopitar. 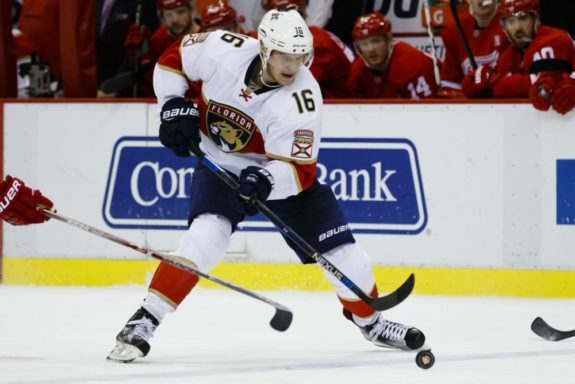 He led the Panthers in points and the NHL with five shorthanded goals. He also started in the offensive zone just 26 percent at five-on-five. Even with a tough zone start split, Barkov was a possession monster with a 52.6 percent Fenwick and 54.5 percent control of five-on-five goals. He played more on the penalty kill last season than ever before, averaging 1:45 per game and won 48.5 percent of draws while shorthanded. His assists-per-game rate has increased every season as has his defensive point shares. With ever-increasing talent surrounding him in Florida, it won’t be a surprise if Barkov is a point-per-game player again in 2018-19, leads the Panthers back to the postseason, and is a Selke Trophy finalist. I feel that Tyler Seguin’s presence among the game’s elite centers is often overlooked or completely forgotten given his one top-five finish in major award voting, yet his numbers show that to be a broad oversight. Since the 2013-14 season, his 173 goals tie Crosby for most in the league by a center and are second only to Ovechkin. He has 25 goals in every full season since his rookie year in 2010-11, has 30 or more in four of the past five seasons, at least 70 points the last five seasons, and has been a point-per-game player three times. Additionally, his four 30-goal seasons since 2013-14 are the most for a center and tie for second overall. He’s also been a strong possession player in his career with positive metrics every season since 2011-12 and had a positive turnover ratio in 2017-18 for the second time. He’s strong in the faceoff circle at 54.9 percent in 2017-18 and played on the penalty kill more last season than ever before with an average of 1:04 of shorthanded time per game. Offensively, he had a career-high 40 goals to lead the Dallas Stars and tie for seventh in the league. Dallas’ top line of Seguin, Jamie Benn, and Alexander Radulov combined for 38 five-on-five goals and 38 power play goals last season and accounted for 37.6 percent of the team’s points. 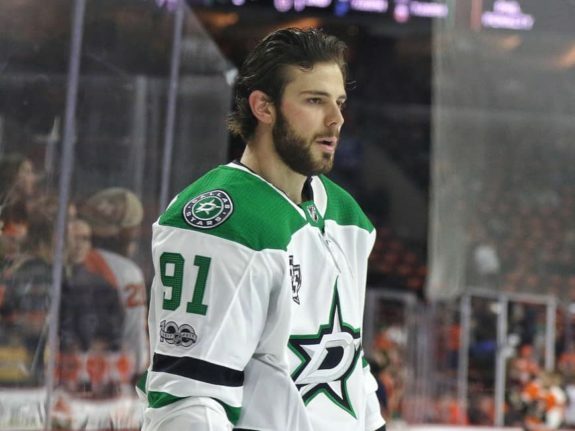 Luckily for Stars fans, Seguin, Radulov, and Benn will be together for at least the next four seasons thanks to the eight-year extension Seguin signed recently. 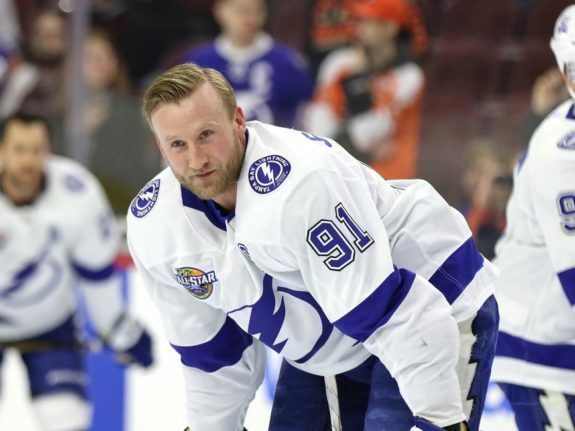 Steven Stamkos changed his playing style in recent seasons from dynamic sniper to strong playmaker. He has two Rocket Richard Trophies to his name along with a top-five finish in Hart Trophy voting in 2012. Between the 2009-10 and 2014-15 seasons, only Ovechkin had more goals than Stamkos’ 253, which were 79 more than any other center. Additionally, since the 2004-05 lockout, only Ovechkin’s 65 goals in 2007-08 were more than Stamkos’ 60 in 2011-12. He is now a playmaker with 27 goals and a career-high 59 assists in 78 games last season, which allows for a goalscorer like Nikita Kucherov to thrive. Stamkos is stronger at taking faceoffs than earlier in his career at 52.2 percent last season, his second straight season above 50 percent. He also had a career-high 59.7 percent control of five-on-five goals. If there’s a downside to him, it’s that he had a minus-23 turnover ratio in 2017-18 and has a lengthy injury with 45 games missed in 2013-14 and 65 in 2016-17. He also relied heavily on the power play for his offense last season with 15 of his 27 goals coming on the man advantage. 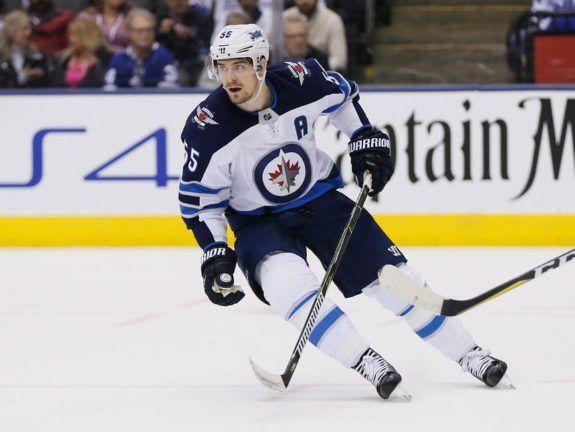 To someone who hadn’t watched a lot of Winnipeg Jets games the past few seasons, it appeared as though Mark Scheifele’s emergence in the 2018 Playoffs as a dominant center came out of nowhere. But that’s not the case. The Jets drafted the 25-year-old 11th overall in 2011 and, after a somewhat slow start to his career, he’s been a point-per-game player the past two seasons. In total, both his points and points-per-game stats increased every season between 2013-14 and 2016-17. In 2017-18, he had 23 goals and 60 points in 60 games and set career highs in time on ice with 20:41 per game and at the faceoff dot with 51.3 percent. He had a plus-10 turnover ratio, which pushed his streak with a positive margin to five seasons. On a line with Blake Wheeler and Kyle Connor, he improved both at five-on-five and the trio accounted for 29 five-on-five goals together. But, as mentioned above, it was in this year’s playoffs that Scheifele became a household name. He had 14 goals and 20 points in 17 games. His 14 goals were second to Ovechkin in the 2018 Playoffs despite Ovechkin and the Capitals playing an additional round. Scheifele nearly made history as there have been only 13 instances in which a player 25 or younger has scored at least 14 goals in one postseason and the second-most goals in the 21st century to Crosby’s 15 goals in the 2009 Playoffs. The 2017-18 season Sean Couturier’s first as a top line center as he was a dominant second or third line center in prior seasons. Last season, he played in the middle between Claude Giroux, a natural center who split faceoffs with Couturier, and Travis Konecny or Jakub Voracek. 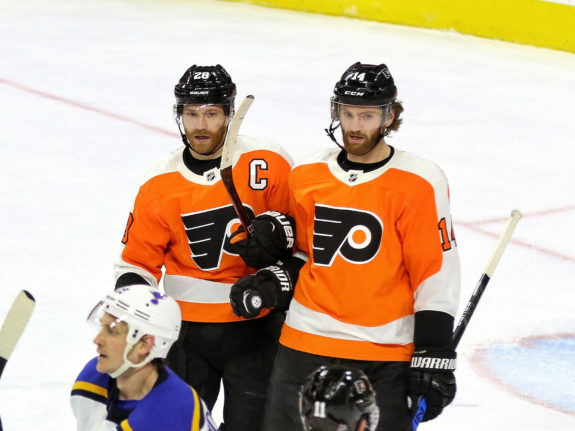 The decision by head coach Dave Hakstol to play Giroux and Couturier together was brilliant as the pair controlled 55.9 percent of shots, 53.3 percent of scoring chances, and 63.6 percent of goals at five-on-five. Yet, just because he found himself on the top line didn’t mean Couturier received advantageous zone starts, but instead started in the offensive zone just 28.3 percent. This was common for him as he had the lowest offensive zone start percentage of any center on the Philadelphia Flyers each of the past five seasons. The jump up the depth chart led to a career-high 21:36 of ice time, the most by a Flyers forward by over a minute and his first time eclipsing the 20-minute threshold. He set career highs with 31 goals, 76 points, and 14 power play points. He also won 52.8 percent of faceoffs, his second straight season above 50 percent. He received more time on the man advantage last season while still playing shorthanded and had a positive turnover margin for the sixth time in seven seasons. In the postseason, he was even better with five goals and nine points in five games, including a hat trick against the Penguins in Game Six of the opening round while playing on a torn MCL. The Capitals have two players who could fit the bill as first line center in Nicklas Backstrom and Kuznetsov. I went with Kuznetsov given his chemistry with Ovechkin and his dominance in the postseason. In 24 games in the 2018 Playoffs, he had 12 goals and led the league with 20 assists and 32 points, the second-most this century and five more than any other Capital in franchise history. He also scored the most famous goal in team history with his overtime winner in Game Six of the Eastern Conference Semifinals. That followed up an excellent regular season in which he set career highs with 27 goals, 83 points, 19 even strength goals, and seven power play goals in 79 games while averaging 18:49 per game. It was his first time as a point-per-game player and came after a down 2016-17 season. But he’s not a typical first line center. For as much of an elite offensive threat he is, he struggles in the faceoff circle at 45.1 percent for his career and was sub-50 percent at five-on-five in Fenwick and control of shots and scoring chances, but did, however, control 55.7 percent of goals. He also dragged down his most common linemates, Ovechkin and Tom Wilson, in the regular season, but picked them up in the postseason. When together, the trio had above 50 percent metrics across the board in the playoffs, including 16 goals for while allowing eight. 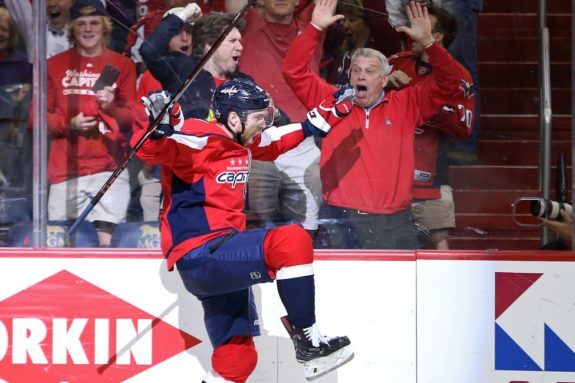 Those 16 goals the Capitals scored represented 30.8 percent of the team’s five-on-five goals in the postseason. Assuming that line stays intact this season, Kuznetsov should continue building off his successful campaign last season and further develop as a top line center. Having Jack Eichel this high on the list is a testament to his strong 2017-18 season and what his future looks like. The Sabres franchise center scored 25 goals and 64 points in 67 games while averaging just over 20 minutes per game last season. His goals, points, and time on ice were career highs and he has now improved his point total, time on ice, assists-per-game, and points-per-game every year in the league. Offensively, there’s nothing to not like about Eichel. He averaged .99 goals-per-60 (G/60) and 2.04 points-per-60 (P/60) at five-on-five, both career highs, and played on the power play and penalty kill more than ever before. His drawback is in the defensive zone and when he’s without the puck. He had sub-50 percent metrics in every category last season and only won 41.5 percent of faceoffs alongside a minus-23 turnover margin. Another issue is his injury history. He missed 15 games in 2017-18 with a high ankle sprain that held him out of the lineup from Feb. 10 to March 10. He had a similar injury in 2016-17 which delayed his start to the season by 21 games. 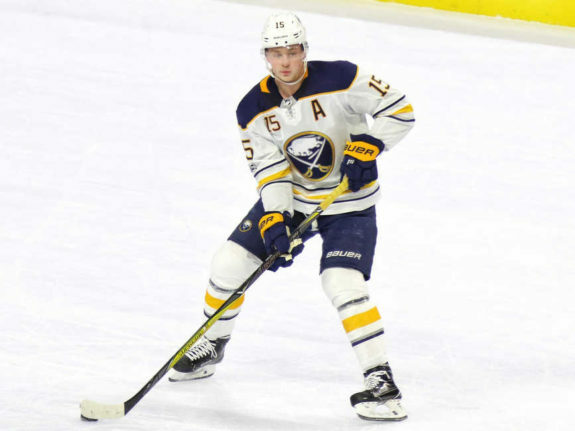 Assuming his ankle sprains aren’t a lingering problem, it will be incredible to see what he brings in his fourth season on an improved Sabres team. Veteran Ryan Getzlaf isn’t the scorer he was earlier in his career with four 25-goal seasons between 2006-07 and 2014-15, but he is now a top-tier playmaker. He hasn’t reached the 20-goal mark since 2014-15 and only netted 11 goals last season, but he has improved his assists-per-game rate each of the past three seasons and his points-per-game average the past two. That includes a career-high .89 assists-per-game (A/G) in 2017-18 when he was a point-per-game player for the sixth time in his career. In 56 games in 2017-18, Getzlaf finished with 50 assists and 61 points but won just 47.8 percent of faceoffs while starting in the offensive zone 33.3 percent. He also had a negative turnover margin as he has every season of his career. It’s easy to not realize how impactful Getzlaf has been in his career. Since his debut during the 2005-06 season, his 875 points are eighth in the league and he’s fourth with 628 assists. In 125 career playoff games, he ranks fourth with 120 points since his debut behind Crosby, Malkin, and Joe Thornton. He is a one-time All-Star, finished top-five in Hart Trophy voting in 2014, and helped the Anaheim Ducks capture the 2007 Stanley Cup. Although he has struggled to stay healthy throughout his career with only two full seasons, he remains an effective player even as he ages. 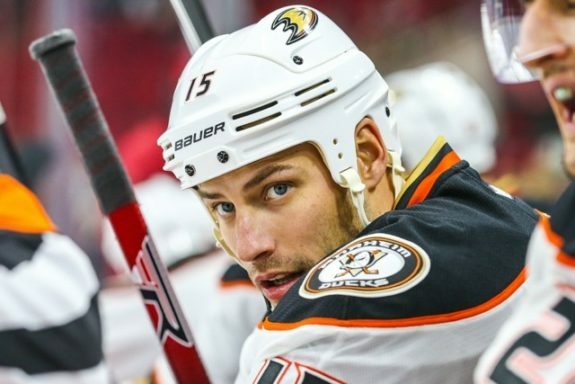 With the possible absence of Ryan Kesler this season, Getzlaf’s importance to the Ducks will be as big as ever. Luckily, with the emergence of Rickard Rakell and his 77 goals the past two seasons, Getzlaf’s ability to be a top-15 first line center should continue. Jonathan Toews, a.k.a. “Captain Serious,” can’t compare offensively to most players above him on this list, but remains a premiere two-way center and possesses the intangibles teams love. He’s never had more than 34 goals or 76 points in a season and has only been a point-per-game player once, during the 2012-13 lockout-shortened season, but has also never won less than 50 percent of faceoffs in a season, has one Selke Trophy, and finished in the top-five six other times. He’s also only had a Fenwick or control of five-on-five shots below 50 percent once in his career and he’s never controlled less than 50 percent of five-on-five goals or scoring chances. He’s always had a positive turnover margin in the regular season and in the postseason, he has 110 points in 128 games while averaging 20:46 per game and winning 56.8 percent of faceoffs. 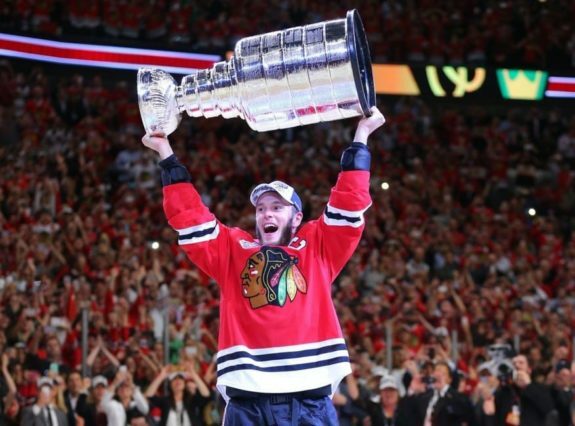 He’s also captained the Blackhawks to three Stanley Cups and won the 2010 Conn Smythe Trophy. The reason he’s this low on the list is because his production has declined in recent seasons. His goals and points have stagnated or decreased each of the past four seasons and in goals-per-game the past six. In 2017-18, those regressions culminated with 20 goals, a career-low and 54 points, his fewest in a non-lockout season. That’s part of the reason why he wasn’t included on the NHL’s list of the 20 best centers for this season. Is that because his skills have diminished? Not necessarily. One reason for his decline is bad luck.He, along with several of his linemates, had worse-than-average shooting percentages. That included Toews and Brandon Saad shooting at a career-low rate while Patrick Kane and Richard Panik shooting their second-lowest rates. Sean Monahan fought through multiple injuries in 2017-18 to set career highs with 64 points, 22 even strength goals, 11 game-winning goals, and .86 P/G. His season ended on March 21 when he underwent wrist reconstruction surgery, two hernia surgeries, and a procedure to repair a groin injury. When considering the injuries he played through, his production was incredible. He netted 31 goals, won over 50 percent of faceoffs for the third straight season, and had positive metrics for the first time. Although the Calgary Flames were a dumpster fire last season and failed to reach expectations, their failure was not Monahan’s fault. He generated offense at career-high rates for himself with 2.32 P/60 and 7.78 shots-per-60 (S/60) at five-on-five, areas he’s improved in every season. Additionally, his individual high danger scoring chances have gone up each year so he’s not relying on elite linemate, Johnny Gaudreau, to generate offense. In fact, it’s the opposite. The line of Monahan, Gaudreau, and Micheal Ferland scored 26.5 percent of Calgary’s five-on-five goals last season and 35.2 percent of the team’s total goals and Monahan was a large reason for that. He improved both players at five-on-five in Fenwick and control of shots, scoring chances, and goals. Gaudreau is a great player, but without a center like Monahan, he wouldn’t produce like he does. 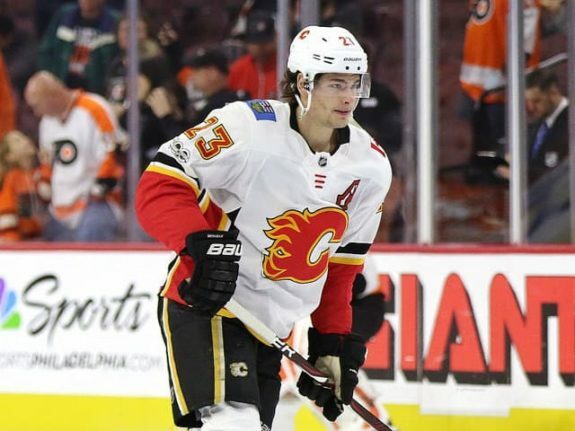 Monahan will be an interesting player to watch in 2018-19. He should be fully healthy, which he wasn’t last season, and Ferland has departed via an offseason trade. In his place is likely to be one of Elias Lindholm or James Neal, both offseason acquisitions for the Flames. Both also have higher offensive upsides than Ferland does and if one of them can find chemistry with Monahan and Gaudreau, it could lead to more production for Monahan. 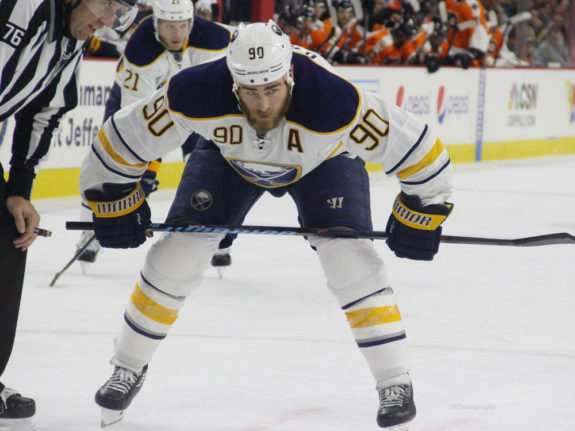 Ryan O’Reilly is not the elite threat to score as other top centers, but he is, hands down, the best faceoff taker in the league. He won 60 percent of draws last season, a career high, and set a single season NHL record with 1,273 faceoff wins, over 200 more than anyone else in 2017-18. It was his third straight season with at least 1,000 wins and the fourth straight increasing both his faceoff percentage and faceoff wins. He started in the offensive zone just 28.5 percent last season, averaged over a minute and a half of shorthanded time per game, and won 55.3 percent of faceoffs on the penalty kill. He is also a strong two-way player with a positive turnover margin every year of his career, including a plus-26 last season. Oh, and he almost never takes a penalty with a career-high 18 penalty minutes and won the 2014 Lady Byng Trophy when he had two penalty minutes. Now, just because O’Reilly doesn’t have the elite offensive numbers of other first line centers doesn’t mean he is unable to produce. In 81 games last season, he had 24 goals and 61 points, both the second-highest of his career, and netted a career-high 15 power play goals. He had the success while playing with Sam Reinhart and Kyle Okposo and increased both players’ metrics. This season, he is a member of the St. Louis Blues and will be surrounded by the most talent of his career with Vladimir Tarasenko as a potential winger. Those two could be dynamic together given each’s skillset. Could this be the season that Tarasenko gets back to the 40-goal mark after two seasons of regression? And will that also lead to further career highs for O’Reilly? Determining where to rank William Karlsson was probably the toughest decision I made putting this list together. He has one season as a first line center for the Vegas Golden Knights and was elite with 43 goals and 78 points, both career highs, in 2017-18. He also set career highs with 31 even strength goals, eight power play goals, four shorthanded goals, and 18:43 of ice time. He led the league with a plus-49 and a shooting percentage of 23.4 and was top-five in goals, even strength goals, and shorthanded goals. His shooting percentage was the highest for a player with at least 150 attempts in the 21st century and is a large reason for his emergence as an elite player. He was still a strong two-way center in addition to his uptick in offense with a plus-32 turnover margin, his third straight with a positive differential, played nearly two minutes per game shorthanded, and had just 12 penalty minutes. He won the 2018 Lady Byng Trophy as a result. 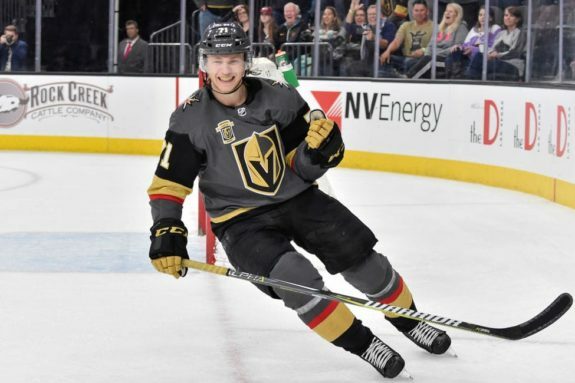 He played on Vegas’ top line with Reilly Smith and Jonathan Marchessault and the trio controlled 67.1 percent of five-on-five goals and Karlsson was the main reason for it, propping up the other two. The line accounted for 27.6 percent of Vegas’ five-on-five goals, 30 percent of the team’s total points, and 34.3 percent of total goals. The biggest question with Karlsson and ranking him is whether or not his 2017-18 performance is repeatable. There have been only 157 instances and 87 players in league history who attempted at least 184 shots, the number Karlsson attempted last season, and shot at least 20 percent in a season. Only 32 players, 17 of which are in the Hockey Hall of Fame, ever duplicated their performance and none of those players did so this century. One thing working in his favor is the return of Smith and Marchessault on a line that had great chemistry last season. The other is that Vegas added Paul Stastny to give them another strong center and Max Pacioretty, who gives them another dynamic scoring threat, making it harder for opponents key on the top line. But, not on his side, is history and only the game’s best have ever repeated what Karlsson did last season. 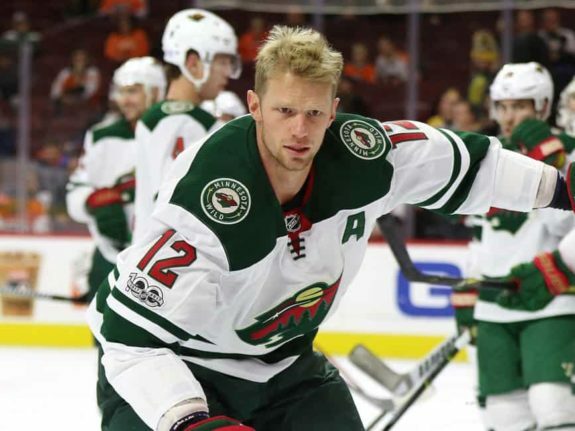 The eldest Staal brother has had a career resurgence the past two seasons with the Minnesota Wild with 70 combined goals. That’s Eric Staal’s most goals in consecutive seasons since he netted 78 between 2007-08 and 2008-09 with the Carolina Hurricanes. His 42 goals last season was the first time he reached the 40-goal mark since 2008-09 and his highest total since 2005-06. The same holds true for his point totals with 76 in 2017-18, tied for third-most of his career, and his highest since 2010-11. In 2017-18, he set a career high with 29 even strength goals and his 1.19 G/60 at five-on-five are his highest since at least the 2007-08 season. Additionally, his 2.48 P/60 in all situations are his highest since the 2012-13 season and both rates have increased each of the past three seasons. He plays in all situations and averaged over one minute of shorthanded time and over two minutes of powerplay time last season and has had a positive turnover margin the past four seasons. Staal was one of the game’s best players earlier in his career with four seasons as a point-per-game player, but hasn’t done so since 2012-13. His 395 career goals are sixth-most in the league since 2003-04 while his 922 points are seventh-most. He is also a one-time All-Star and finished top-five in Hart Trophy voting once. We’ve reached a point in the list where each of the remaining players either haven’t been a number one center in the past but will be this season, shouldn’t be a top center but is, or is young and with little history of production. The San Jose Sharks don’t have a clear top center with Logan Couture, Joe Pavelski, and Joe Thornton all having filled the role in recent seasons. 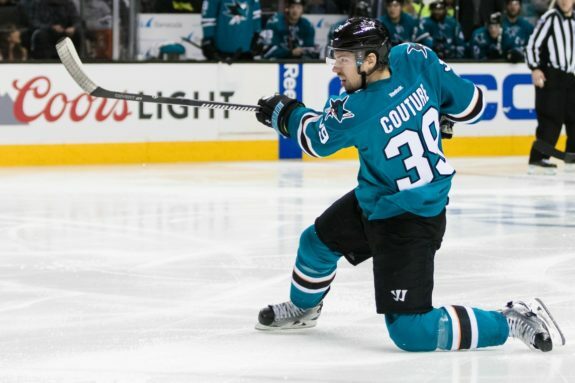 I went with Couture because he best provides the skills necessary to be a first line center and because the Sharks paid him like one with the eight-year, $64 million extension they gave him this offseason. But, he doesn’t have history of consistent, top line production. In 2017-18, he scored a career-high 34 goals alongside 27 assists in 78 games and also set a career high with 22 even strength goals. It was his third season with at least 30 goals or 60 points but he’s never been close to a point-per-game player. He also isn’t good at taking faceoffs with four straight seasons below 50 percent, including 45.8 percent last season. But, he has been scoring at consistently higher rates in recent seasons despite a decrease in generating offense. His .44 G/G in 2017-18 tied a career high while his .78 P/G represents an increase each of the past three seasons. He shot 16.1 percent, another career high, while experiencing career lows in generating shots, scoring chances, and high danger chances. But, if he can generate even more offense, either on his own or through increased chemistry with linemates, Couture is likely to further surpass career highs and assert himself as a bonafide top center. Like Couture, Predators’ first line center Ryan Johansen isn’t an ideal choice to center a top line. He is one of the game’s better two-way centers who thrives in the faceoff circle and defensive zone and generally has strong possession metrics, but doesn’t score at a rate that’s expected from the role. In his seven-year career, he has one, maybe two, seasons of top line production, in 2013-14 with 33 goals and 63 points and 2014-15 with 26 goals and 71 points. He has never been a point-per-game player with a career-high .87 P/G, set during the 2014-15 season. 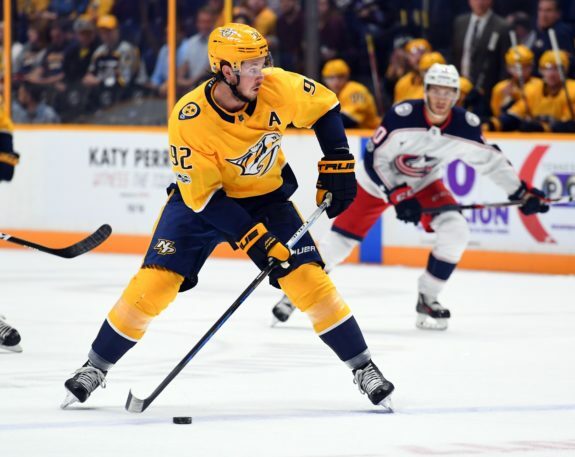 Last season, he totaled 15 goals and 54 points in 79 games, which ranked seventh and fourth on the Predators, respectively. He was better in the postseason with five goals and 14 points in 13 games. Johansen’s problem is that not only is he not an elite producer, he’s actually regressing offensively with 2.21 P/60 in 2017-18, his third straight season of decline. But not only is he not producing, he’s also not generating offense with a career-worst 5.28 S/60 while still shooting above his career average. The same holds true at five-on-five and on the power play despite averaging a career-high 3:02 on the man advantage in 2017-18. He is still a serviceable center but he’s unable to create offense on his own like those ahead of him on this list. Part of what makes him productive is playing on a line with Filip Forsberg and Viktor Arvidsson, both with at least 25 goals and 60 points last season. Johansen is still a good center, just not a prototypical first line center. With the noise that surrounded Matt Duchene when he was with the Colorado Avalanche that led to his trade to the Ottawa Senators, it’s easy to forget how productive he was last season. Duchene was regularly the Avalanche’s best player and he led the team in points four times in nine seasons. Surrounded by questionable talent, he only had a positive Fenwick score once in Colorado, but still managed a positive turnover margin every season, so he’s safe with the puck. In 82 games last season, he had 27 goals and 59 points, including 23 goals and 49 points in 68 games as a Senator and won 53 percent of faceoffs. He led the Senators with eight power play goals and had an even turnover margin after the trade but was picked up by his wingers, Mike Hoffman and Bobby Ryan. His 27 goals tied for the second-most of his career and his 59 points tied for third-most while all while averaging 18:20 of ice time, fourth-lowest of his career. What keeps Duchene low on this list is that he’s not good enough to center a contender’s top line but is too good for most second lines. His ideal situation is similar to what the Maple Leafs and Penguins have with two skilled centers with similar ice times each game. 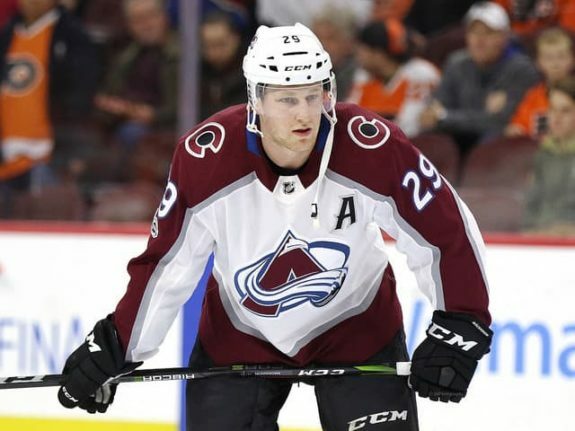 In Colorado, he was forced into a top line role for much of his career before MacKinnon arrived and the same held true in Ottawa as the Senators gave up Kyle Turris to acquire Duchene. The reason he’s more suited as a second line center on a good team is because for how safe he is with the puck and how strong he is in the faceoff circle, he’s never been a point-per-game player with a career-high .99 P/G in 2013-14 and has never scored more than 70 points in a season. 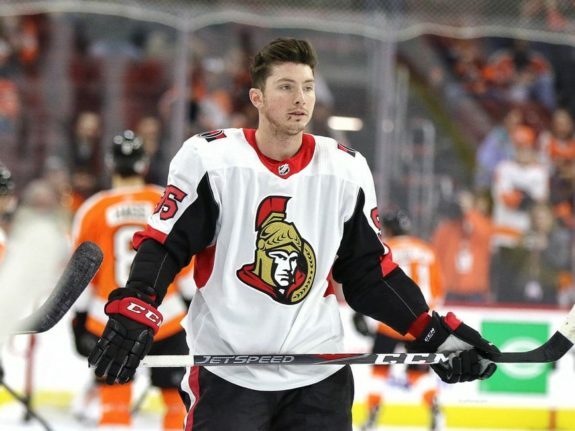 Duchene is unlikely to find that elite production this season, either, now that Mike Hoffman and Erik Karlsson are gone. The Sedins are gone and for the first time in over a decade, there will be new faces of the franchise for the Vancouver Canucks. One player who can become a new face is Bo Horvat, their first line center in 2017-18. The Canucks were preparing him for this moment as his ice time increased each year in the league with a career-high 19:21 last season, two minutes more than any other Vancouver center. In a career-low 64 games, the result of a fractured foot in December, Horvat scored 22 goals, the most of his career, 44 points, and won 53.8 percent of faceoffs, the highest of his career. His career is trending up with an increase in goals, goals-per-game, and points-per-game every season and he’s won at least half his faceoffs every year. A big reason for his improvement was the addition of rookie Brock Boeser, whose 29 goals paced the team despite missing 20 games. When playing together, Horvat and Boeser scored 23 of Vancouver’s 138 five-on-five goals. Boeser positively impacted Horvat’s ability to generate offense as the latter attempted 7.05 S/60 at five-on-five, a career high. He also feasted on the power play with 2:42 on the man advantage per game, a career high, and averaged 3.43 G/60 while shooting 28.6 percent. 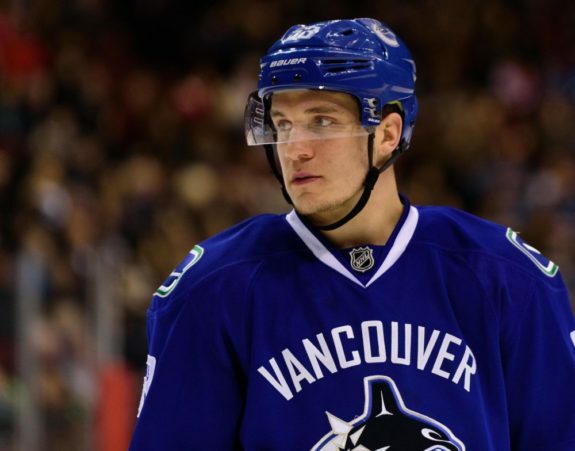 Although Vancouver isn’t expected to be good this season, Horvat should continue developing into his role on the top line, especially with Boeser as one of his wings. Add to the line one of the team’s talented forward prospects like Adam Gaudette, Jonathan Dahlen, or Kole Lind and the Canucks will have a dynamic top line. 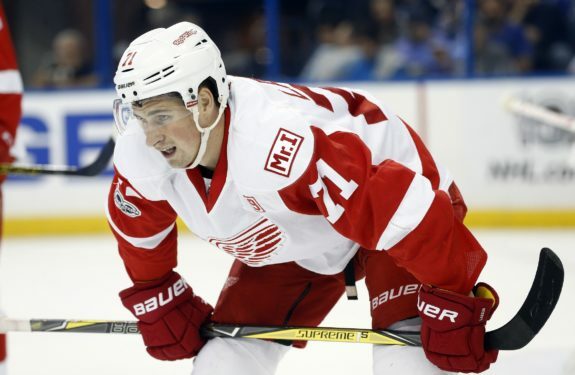 Dylan Larkin broke onto the NHL scene with a solid rookie season in 2015-16 with 23 goals and 45 points, both the highest for a Detroit Red Wings rookie in over 20 years. He regressed in his sophomore season but bounced back to lead the Red Wings with 63 points last season as he became their top center down the stretch. He led Detroit forwards in ice time with 19:51 per game, the most of his career and his first time over 17 minutes. He’s improved in areas key for a top center to be successful in, including an increase in faceoff percentage every season from 41 percent in 2015-16 to 49.9 percent last season. He had a career-high 1.63 assists-per-60 (A/60) at five-on-five last season which increased his points-per-60 despite a regression in goals. He played more on both special teams units than ever before and shot a career-low 3.7 percent on the man advantage, an indicator of why his goal total decreased. Which players are Larkin’s linemates this season could have an impact on how he follows up his career season of 2017-18. Andreas Athanasiou, Thomas Vanek, and Filip Zadina could be options to play on the top line. Regardless of who he plays with, more will be asked of Larkin than ever before with Henrik Zetterberg calling it quits. That leaves Larkin as the only center on Detroit’s roster with the skills to be a top center. Last year’s first overall draft pick Nick Hischier had a solid rookie season although it was overlooked due to dynamic seasons by other rookies. From the start, Hischier was the New Jersey Devils’ top center and played on their most productive line with Hart Trophy winner Taylor Hall on his wing. Hischier’s stats don’t jump off the page with 20 goals and 52 points in 82 games, but he went up against opponents’ shutdown lines. He only averaged 16:19 of ice time but still had a plus-30 turnover margin and positive five-on-five goal control. 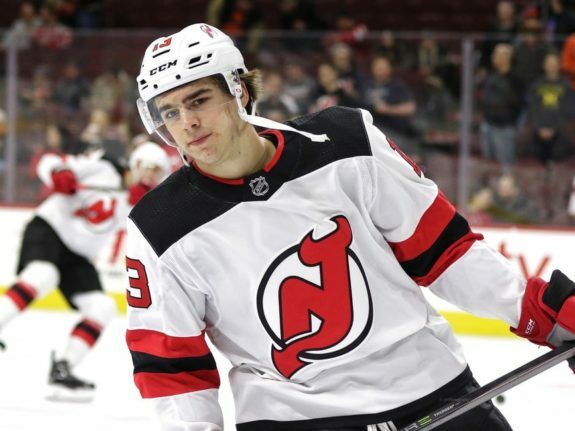 He had a great deal of production at five-on-five with 2.38 P/60, second-highest on the team after Hall among Devils with at least 500 minutes, while having the team’s sixth-highest shot rate at 7.84 S/60. He played on both special teams units, helping a penalty kill that tied for seventh and a power play that was 10th in the league last season. He needs to develop in the faceoff circle as he won just 42.9 percent of total draws last season but 54.6 percent on the penalty kill and 50 percent on the man advantage. That leaves 42.5 percent at five-on-five, likely the result of facing stiffer competition than the usual rookie center. Given Hall’s presence on his line, Hischier should continue to increase his production levels, especially with an increase in playing time that will come with experience. If he can work on his faceoff skills and get closer to 50 percent, he will climb higher on this list. Of the 72 rookies labeled as centers on Hockey-Reference who played a game last season, only Hischier and Columbus Blue Jackets center Pierre-Luc Dubois played on their teams’ top line. Dubois had slightly less production with 20 goals and 48 points in 82 games. He averaged 16:38 of ice time, won 43.8 percent of faceoffs, had positive metrics across the board, and had a plus-nine turnover margin. 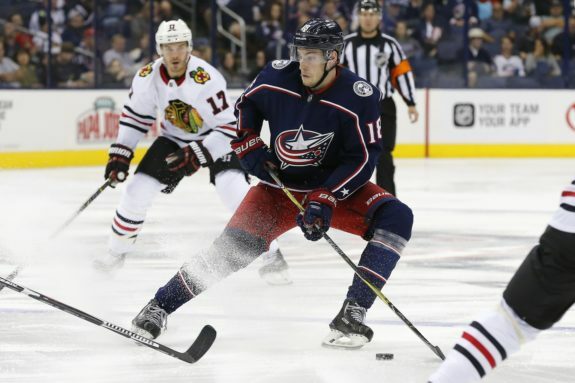 He played on Columbus’ best and most used line with Artemi Panarin and Josh Anderson, which controlled 59.3 percent of five-on-five goals. Panarin and Dubois had similar metrics and improved each other while Dubois had a positive influence on Anderson. The Blue Jackets drafted him third overall in 2016 behind Matthews and Patrik Laine. When he didn’t make the NHL in his rookie season, Dubois was viewed as a bust by many because he was drafted to be a center despite not playing the position in juniors. Columbus’ decision to be patient with him was smart and has paid off. He should continue to develop after a full season and, like other young centers, needs to develop in the faceoff circle. However, the potential departure of Panarin via either trade or free agency could impact Dubois’ future production. 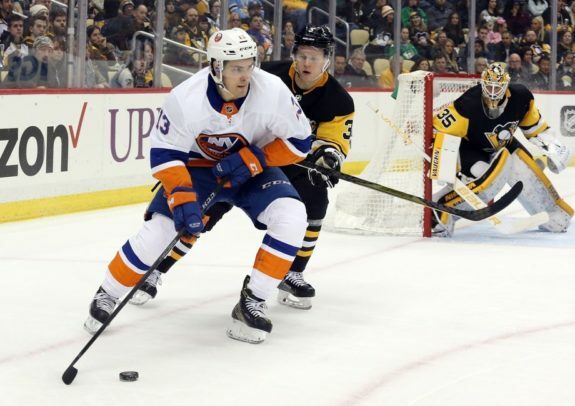 Reigning Calder Trophy winner Mathew Barzal was the second line center for the New York Islanders last season. Playing behind the Tavares, Josh Bailey, and Anders Lee line allowed Barzal’s line to thrive against easier competition. That allowed him to thrive with 22 goals and 85 points in 82 games. His 85 points were the highest for a rookie since Malkin had 85 in 2006-07 and the highest for an Islander rookie since Mike Bossy posted 91 in 1977-78. He also had 20 more points than any other rookie last season. He had positive metrics and played on both special teams units in 17:46 of ice time. He won just 42.6 percent of faceoffs and had a minus-23 turnover ratio. He did, however, pace the Islanders with 2.88 P/60 at five-on-five while playing on a strong line with Jordan Eberle and Anthony Beauvillier that controlled 61.9 percent of five-on-five goals, the highest percentage on the team. Part of the line’s success was rooted in the insulation the trio experienced due to playing behind Tavares’ line. This season, Tavares is gone and Barzal will be the Islanders’ top center. That means facing tougher matchups, playing harder minutes, and being singled out as the team’s top threat. There’s no reason to not expect him to still produce, but perhaps a 70-point season signals success rather than a repeat 80-point season. If he fights through it and produces, he will prove himself capable of playing a top line role. But for now, he remains a first line center whose only experience has been on the second line. 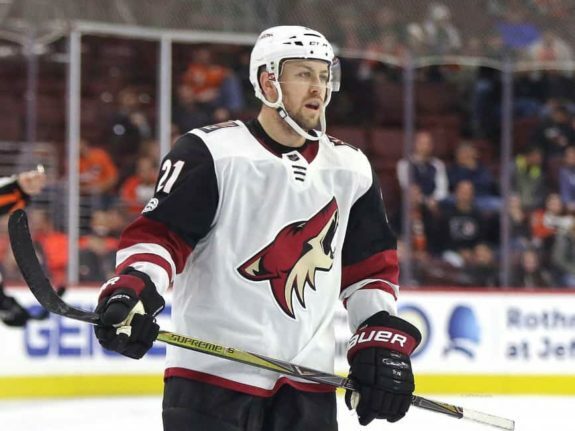 After going through an adjustment period with just eight points in his first 20 games, Derek Stepan’s first season with the Arizona Coyotes was successful. He finished with 48 points in his final 62 games to finish second on the team with 56 points. While his 14 goals were a career low and the second straight season he’s regressed in the category, his 56 points were second-most of his career and represent consecutive seasons of growth. He also shot a career-low 6.7 percent but won 47.7 percent of faceoffs, the highest of his career, and averaged 19:16 of ice time, his highest since the 2012-13 season. He controlled over 52 percent of five-on-five goals and was tasked with playing on both special teams units. Additionally, he was plus-14 in turnovers, his seventh season with a positive margin. Joining him on the top line was rookie Clayton Keller, a natural center, and Brendan Perlini, who had career highs in goals and points last season. Keller and Stepan had similar metrics at five-on-five and each improved the other while Perlini needed the other two to be successful. The problem is that for as strong of a season as Stepan had in 2017-18, he isn’t a first line center. While he has six seasons with at least 50 points, he has never reached 60, never scored 25 goals, and doesn’t have the skillset to drive Arizona’s offense on a game-by-game basis. If the Coyotes are to become consistent contenders, they are going to need a center who can generate offense at a higher rate than Stepan. Is Keller that player? Could 2018 first round pick Barrett Hayton solve that need? Both, either, or neither could be the answer, but for now Stepan is that player and he’s not very good in the role. When Jordan Staal was with the Penguins, he was their third line center behind Crosby and Malkin and was too skilled for the role. So the Penguins dealt him to the Hurricanes to center their second line behind older brother Eric. Jordan was great in that role as it allowed him to use his two-way skills that made him such a good third line center. But then the Hurricanes traded Eric and it left Jordan in a top line role. Jordan is a good player. He’s won at least 50 percent of faceoffs every season since 2011-12, including 56.6 percent last season, has positive metrics, succeeds on both special teams units, and has had a positive turnover margin every season. Yet he doesn’t have the abilities to produce like most first line centers. He’s had 50 points once and has two seasons of 25 or more goals. But, so far, he’s the best center Carolina has, at least until either Martin Necas develops more or they use one of their blueliners to acquire one. 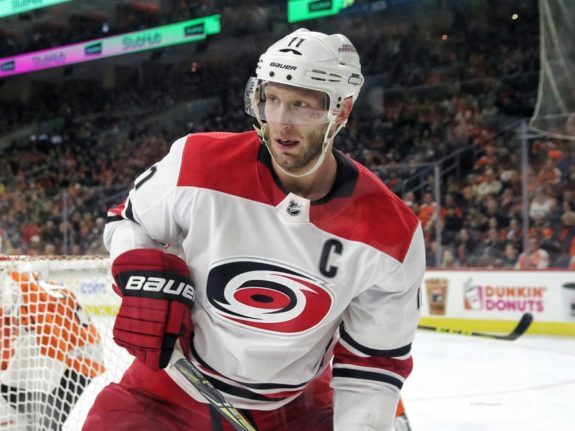 Staal centered Carolina’s best line with Sebastian Aho and Teuvo Teravainen on the wings. That line scored 16 more five-on-five goals than any other. Aho and Teravainen finished one-two on the team in points and both players have increased their point totals the past two seasons and make Staal more productive than he naturally is. 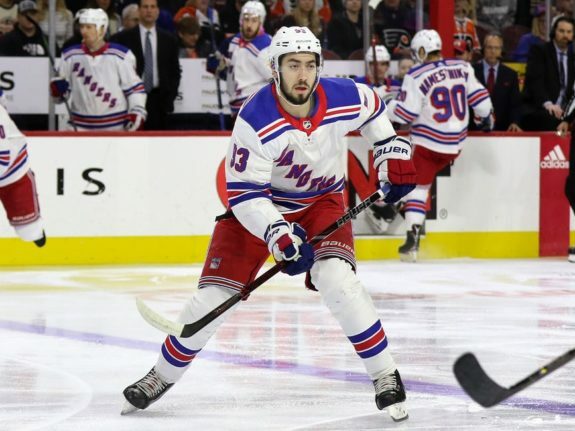 In year one of the New York Rangers rebuild, Mika Zibanejad set a new personal best with 27 goals and his 47 points were the second-most of his career. Of his 27 goals, 14 were scored on the man advantage, 27.5 percent of the team’s 51 goals on the power play. He did so while shooting 12.7 percent in all situations and averaging 17:58 of ice time, a career high. He also won 50.8 percent of draws, his third straight season above 50 percent. He did have positive possession metrics but the Rangers had a minus-16 goal differential at five-on-five with him on the ice. At five-on-five, he had career lows of 1.35 P/60 and .64 A/60 while averaging 8.63 S/60, second-most of his career and shooting 8.2 percent, his second-lowest rate. He played over a minute shorthanded per game and almost three minutes on the man advantage and set career highs in power play production. He struggled to protect the puck with a minus-14 turnover margin, his second season with a negative differential. Zibanejad isn’t a terrible center but isn’t cut out for the top line. A team can’t rely on a top center who is sub-50 percent at faceoffs and has a negative goal differential. Before the Rangers can be competitive again, they will need a more reliable and productive option than him. 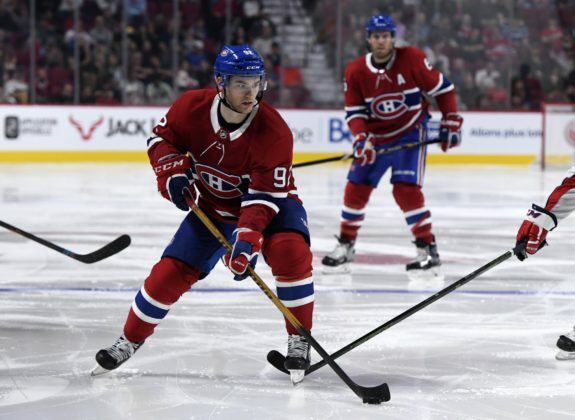 Although he was a winger with the Lightning, the Montreal Canadiens acquired Jonathan Drouin to be their first line center despite having never taken more than 250 faceoffs in a season at the NHL level. So the odds were already stacked against him. Compile that with an average-at-best forward core and the pressures of playing in Montreal as a Francophile and the season was almost destined to be a disaster for him. In 77 games, he managed just 13 goals and 46 points, averaged 17:36 of ice time, and won 42.5 percent of faceoffs. He regressed in nearly every category relative to 2016-17. He controlled 40.7 percent of five-on-five goals and his production decreased for the second straight season. He also didn’t kill penalties but had a career-high 3:16 of power play time per game. Unfortunately that increased ice time didn’t lead to production as his goals and points-per-60 on the power play decreased from last season. His minus-two turnover margin was his third straight with a negative differential and his line with Brendan Gallagher and Paul Byron, his two most common linemates, was Montreal’s fourth-most used line. Drouin actually hindered both of them at five-on-five, the opposite of what’s expected from a top center. Long-term, his best fit is on the wing, but that will have to wait until one of Jesperi Kotkaniemi, Nick Suzuki, or Ryan Poehling take over the top center role.